Whoever lives or has passed through Shabla has admired the “Blue House”, as often called, but few have any idea what a tidy garden and beautiful swimming pool are behind its high fence.“Glenda” offers accommodation in two self-formed suites, each with separate entrance, two bedrooms and a spacious living room with equipped kitchen. If you are looking for some peace and quiet, villa “Borisov” might be the right place for you. Located only 20 meters from the famous Lighthouse at Cape Shabla and from the beach, it perfectly combines the beauty of this wild place and the coziness of your home. 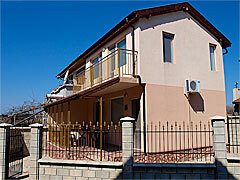 The villa has 3 double rooms, 1 twin room and a studio with a double bed and a sofa bed. All rooms have private bath / toilet, refrigerator, air-conditioning, cable TV and balconies overlooking the beach near the Shabla Lighthouse. In the fishing village of Karia at Cape Shabla you will find excellent conditions for bathing-beach, fishing and boating. You can eat fresh fish and fish soup at the famous Uncle Pesho or you can heat yourself with the hot healing mineral water which springs only 50 meters from the villa. 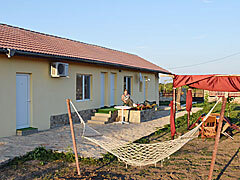 The house offers you time-off in 2 bedrooms and a fully equipped kitchen. Rooms and houses “Viola 1″ and “Viola 2″ offer 8 comfortable rooms , each of them with bathroom , TV , air conditioning, common kitchen and barbecue. 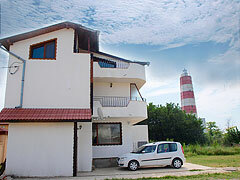 The houses are located in the center of the village Ezerets, just minutes with car from the beach. The beach near Ezerets is unique with it’s clean water and sand, and in the village you can enjoy the silence and the peacefulness of the nature..